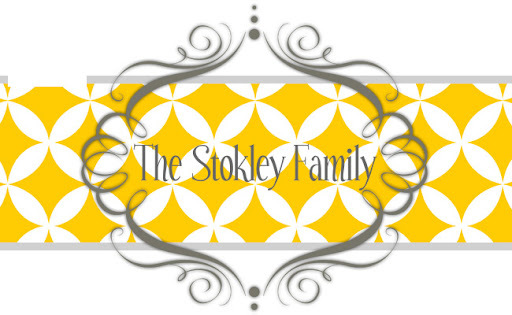 The Stokley Family: Birthday Weekend! I am EXHAUSTED!! Like so exhausted I took the kids to school late because no one wanted to get up. Friday I had my birthday lunch with my Mom and Aunts at Fuego and it was so good!! Friday night we went to dinner with a lot of our friends...not sure why I didn't get very many pictures. :( Ryan always trys to get everyone together to celebrate my birthday. I think he feels bad that I have to share it with Ryleigh. Saturday morning it was time to celebrate this little girl being 7!! She woke up and had a scavenger hunt for her presents. She was very excited when she saw her kindle. Ryan has tricked her and wrapped it in with soccer cleats she has already worn so when she moved those and noticed the kindle her face was priceless!! Her friend Chloe came over that morning and she opened her presents from Chloe. One was a matching outfit! They were over the top excited about that. We even went to get matching pink hair extensions that morning then shopping then Chick Fil A for lunch. We are done with big birthday parties. I hate them. So Ryleigh wanted to take her friends to see OZ the Great and Powerful. Then we had her party at moms that night with family and friends. Saturday night her friends spent the night and Sunday was my birthday!! We got up that morning and went to church but not before Ryan gave me my present. He gave me the finest Michael Kors purse!! Of course I'm taking it back because he spent WAY to much money and didn't even try to get it on sale!! I'm going to the outlets on Tuesday to get the same purse for half the price :) You gotta love him for trying though!! Sunday afternoon Mom cooked my birthday lunch. Homemade chicken tenders, mashed potatoes, broccoli and cheese casserole, mac and cheese and bread. Yes, carbs, carbs and more carbs!! Sunday afternoon was spent how most of our Sunday afternoons aren't spent now days. A yard full of kids playing. They multiply every Sunday but we love it! That afternoon Whitney came over and we got crawfish and played a very intense game of kickball with all the kids. It was a lot of fun!! On the way in that night, instead of giving me a birthday whipping they sprayed me with the water hose instead. I was soaking wet and freezing!!! Thanks everyone for making mine and Ryleigh's birthday special! It was a great weekend!! !